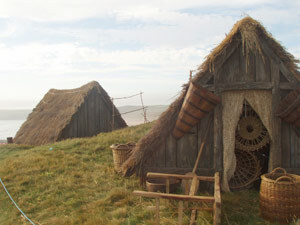 Thatched Seaweed Drying Huts - 2009 Robin Hood Film set at Freshwater West, Pembrokeshire. 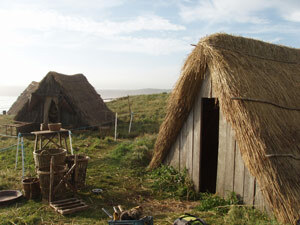 Film set work on Seaweed Drying Huts for the 2009 Robin Hood Film. 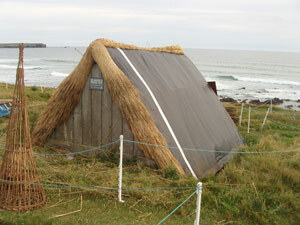 This seaweed drying hut on the cliff overlooking Freshwater West» was built by the Pembrokeshire National Park Authority some years ago to reproduce an example of one of the many huts that would have once occupied this site. 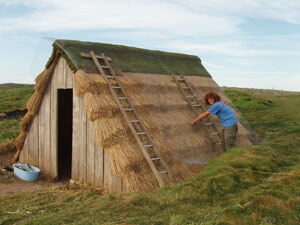 They were built by the local womenfolk from driftwood with marram grass thatch and turf ridges. 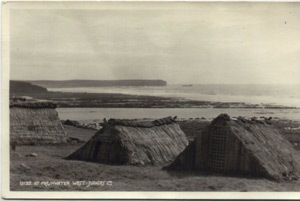 The womenfolk collected laverbread», a seaweed variety that grows in abundance roundabout the coast here and hung up to dry in these shelters ,sold to the demanding market in Swansea and elsewhere, sadly this is a industry all but now vanished from our shores. As the thatch had deteriorated we re-thatched it with some water reed left over from a job in stack pole nearby for the cost of materials only, as to reproduce an authentic roof covering over modern sawn timbers would be a bit of a waste (there has been talk of reconstructing an authentic version one day). Time passed and we got a call from the makers of a new robin hood film with a view of helping to reproduce a film set depicting life in a poor Brittany fisherman’s village. The thatch on the existing reconstruction was considered too neat and tidy so we had to thatch over it all again this time making it more suitable for filming purposes. The sheet over the roof in one of the pictures is so we could strike the set avoiding any damage to what was already there. Several more dummy buildings turned up on site all requiring either complete thatching or just finishing of, it was interesting to be on the cliff when the battle scenes where being filmed on the beach below. The set designer, Arthur Max» took photos of our work which were sent to Thatcher’s on a different film set location to show them how he wanted things to look, a nice compliment. The film makers paid us an additional fee to leave the original hut in a better condition than when we had started, this provided a new turf ridge - a nice touch I thought!